frequent pleas to David and Quinland for just a little bit of help, if they did not mind chipping in, thankyouverymuch. If you read “pleas for help” as “guilt trips” and/or “unprovoked shrieks of madness,” I forgive you and am happy to give your bugging devices back if you tell me where you have them hidden. It has been a very different Christmas for me this year. Thanks to the twin terrors of procrastination and prednisone, I left every possible thing to the last possible minute. It came to me with shocking clarity on December 22nd – when I suddenly felt like I could get started on the whole gift-shopping-and-wrapping thing – that I did not have enough time to get everything done in the efficient manner I usually do. The difference? I decided that I simply couldn’t stress about it. I needed to keep myself healthy, keep myself same, and keep the peace. didn’t micro-manage the whole gift-opening process, and thus did not stress about the whole did-everyone-receive-the-same-number-and/or-value-of-gifts thing. I’d like to say that none of it mattered and that the entire holiday was pleasant and completely stress-free. This wasn’t true, of course. First and foremost, it was hard. It took deep breaths and constant refocusing and frequent reminders of what I was doing and why I was doing it. It was uncomfortable and unrewarding. Second, others were baffled, if not downright disappointed. I’m sure just about everyone wondered why they were told, “Oh, hey – I have a present for you, and I’ll get it to you as soon as I get a chance to wrap it…” and how that chance still hasn’t come by 11 pm on the 25th of December. So, how did I succeed? Very well, thank you! I’m still pretty tired, but I didn’t have any major health issues, which is key. I really did keep my stress level down, and I had the most peace-filled Christmas I have ever experienced. Best of all, I have had an incredibly good time. My family has had so much fun together, and I haven’t ruined that by being frazzled and shrill. So, how were your holiday celebrations? Did you stick to the old ways or try something new? Was all calm and bright, or hectic and harried? 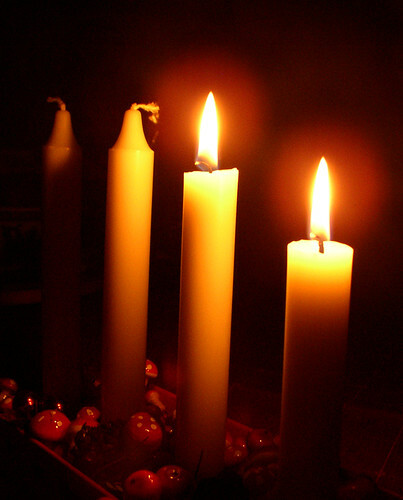 … and – all through the house – you’d hardly know that Advent was here. But this is not about beating myself up; this is about shining a light on things and bringing them out into the open. Only then can I make a plan for how I want to move forward! Here’s my plan: I’m going to go find the Christmas box that has the Advent wreath in it. I’ll set that up right in the center of the dining room table and – gladly – make the time each night to light a candle and spend some time getting ready to celebrate Christmas, not just at church, but right here at home, in the middle of our real lives. Thanks to Per Ola Wiberg for the photo! When I started this blog, I wanted to let go of things that were weighing me down. I’d just gotten an official diagnosis of MS, and I was facing the uncertainty of my future with that unpredictable disease. I decided to try to cut down on stress by getting rid of clutter, working to get healthier, and trying not to worry so much. The idea was that the blog would keep me accountable to myself. Over time, things evolved. I got rid of load after load of household clutter, though I still have far to go. I lost 20 pounds, started doing yoga, and gave up meat and dairy. I took a six-month leave of absence from work to travel around Europe with David and Quinland. All this has given me a new perspective on life, and I have found myself re-thinking what “Lighten Up” – the blog and the phrase – means to me now. My original definition of “Lighten Up” was based on weight. I wanted things to be less heavy. I wanted my material possessions to be reduced, my weight to go down, my mood to go up, my schedule to be less hectic. All of those things have happened, to some degree. Now, I’m going to start looking at another facet of the word “lighten” – making things brighter. I’d like to shed light on the corners of my life, to see how I can continue to simplify it. I’d like to light a path to the future for my son, by sharing the things I believe about life and how to live it. I’d like to spread light in the world by seeking ways to serve others, instead of focusing so much on myself. I am sure that as the days go by, I’ll think of more examples! I hope that each post in this blog will document some instance of “enlightening” myself or my world. So that’s my new mission. Thanks for coming along for the ride; your comments are welcomed and appreciated more than you know!